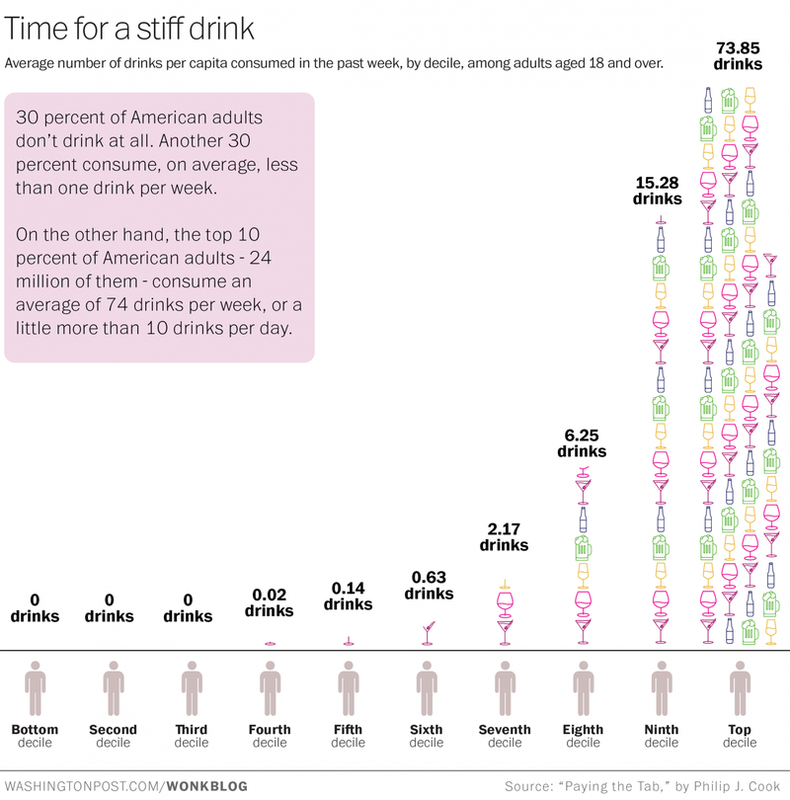 How Do Your Drinking Habits Compare To The Rest Of The Country's? If you have two drinks a day, you're only in the top 20% of of American adults in terms of per-capita alcohol consumption. ...in order to break into the top 10 percent of American drinkers, you would need to drink more than two bottles of wine with every dinner. And you'd still be below-average among those top 10 percenters. As Ingraham points out, if you're in that top decile, you almost certainly have a drinking problem of the heart-, brain-, and liver-melting variety (as opposed to other, less-obvious varieties ). Philip J. Cook – from whose book, Paying the Tab, Ingraham's statistics originated – highlights another disturbing takeaway: "The heaviest drinkers are of greatly disproportionate importance to the sales and profitability of the alcoholic-beverage industry," he writes. "If the top decile somehow could be induced to curb their consumption level to that of the next lower group (the ninth decile), then total ethanol sales would fall by 60 percent."